I don’t often post on Sunday but I want to share a special sale & it can’t wait until tomorrow! Make Over Your Mornings SALE! 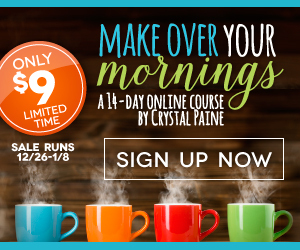 One of my favorite bloggers, Crystal Paine of Money Saving Mom has put her Make Over Your Morning eCourse on sale. (affiliate link). It is ONLY $9(normally $17). After I bought this eCourse in August, I was blown away by Crystal's down to earth guidance on getting the most out of your mornings and whole day. There are not many products that I promote on this blog but this eCourse has made a difference in my life and I think you would get a lot out of it too. It's a bargain at $9 for all that you get in the course. There is a video each day plus a PDF workbook and related links that tie into each lesson. You NEED this if you are struggling! So . . . . if you struggle with having productive days, Crystal gives excellent guidance in this course on how to start your day the right way so that the rest of your day goes well. You don't have to be a morning person! I've changed into a morning person and I like it Ask my family, I've never claimed to be a morning person. In fact I know that I am not but in the past 6 months I've found out what happens when I get up and have a plan for the day. After implementing the things that I've learned from Make Over Your Mornings shared with my readers how I changed my mornings to be awesome. I plan to use this eCourse again in January to set up our routines going after the holidays to get 2016 off to a great start. Get Make Over Your Mornings today and begin the new year with a fresh start. Note: This sale runs from December 26, 2015 – January 8, 2016. Merry Christmas from Day to Day Adventures! !